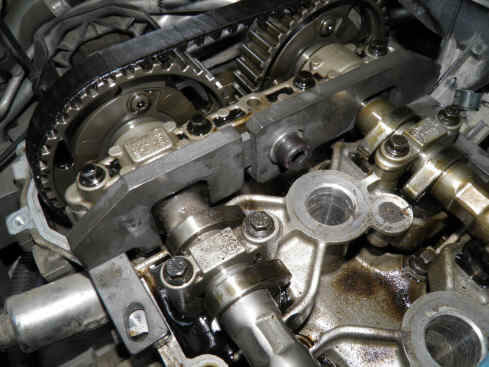 Timing belt replacement on Peugeot EB2 1.2 VTi PureTech engine (part 1). SAFETY: WORK ONLY ON A COLD ENGINE. RISKS OF HAND INJURY / SKIN IRRITATION DUE TO A TINY WORKING SPACE. 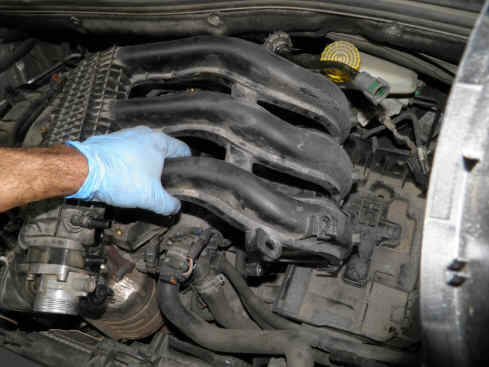 Timing belt replacement requires a minimum of know-how in general car mechanics. Replacing it also demands understanding how it works. 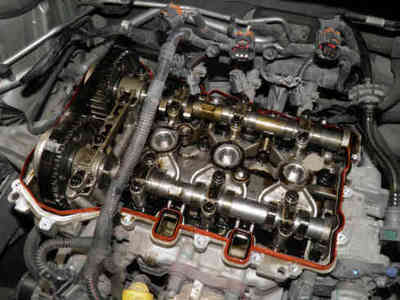 Not less than 6 hours necessary for a DOHC engine but you could spend the whole day depending on how used you are to carry out such works. 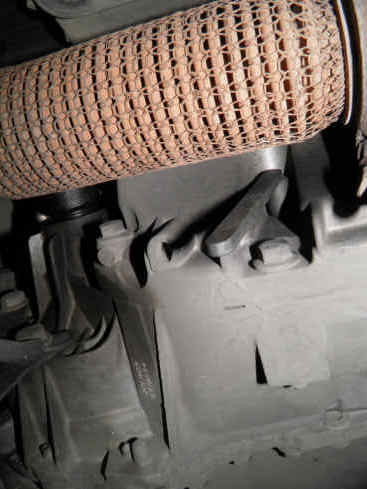 Peugeot manuals declare a 180,000 Km lifetime for this timing belt whatever the driving conditions. 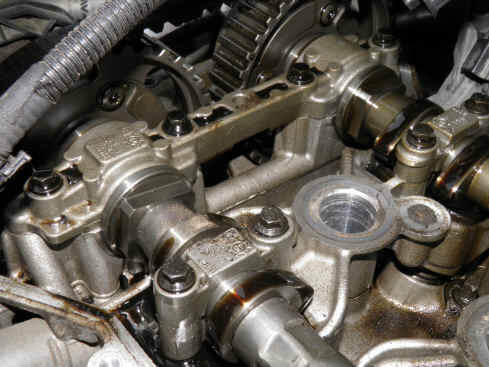 The extended lifetime compared to a usual 100,000 Km is due to its installation in the same location as a timing chain, i.e. 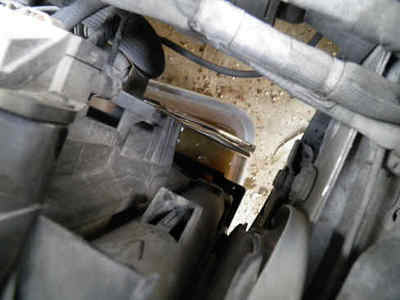 where the engine oil and/or oil vapors are present. The real world is different however. 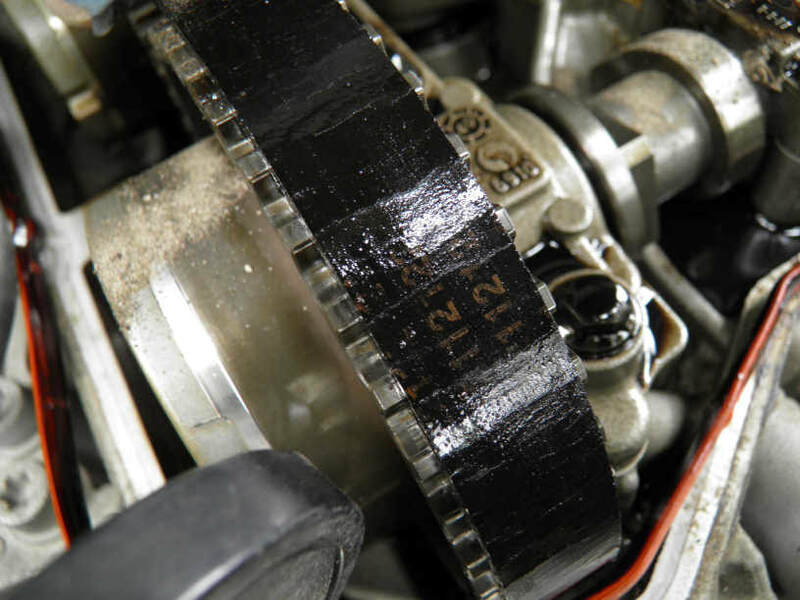 See the cracks on this timing belt that ran for 130,000 Km. The belt is no more properly tensioned. It is recommended to proceed with the timing belt replacement between 75,000 and 100,000 Km especially the intervention on this 3-cylinder engine is relatively easy. 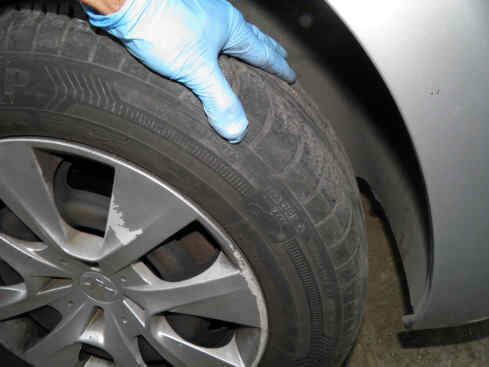 Making sure you have downloaded the procedure for your vehicle (middle). We always recommend obtaining the manufacturer's procedure to enable you compare to our method which is made simpler on purpose. 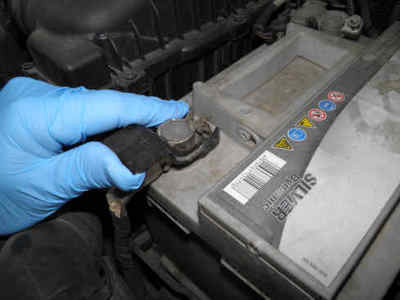 Disconnect the battery then remove the air box and air filter housing. 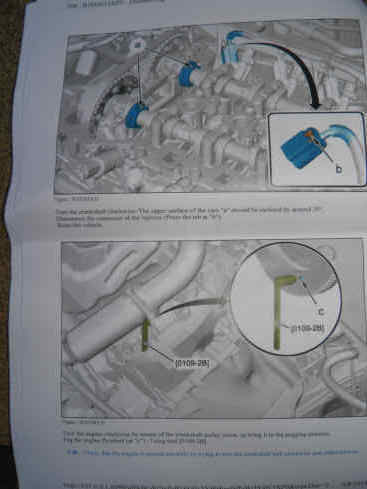 Drain the coolant (middle left) as this is needed for disconnecting a coolant hose for the intake manifold removal. Loosen the battery tray (middle right) and take out the intake manifold (right). 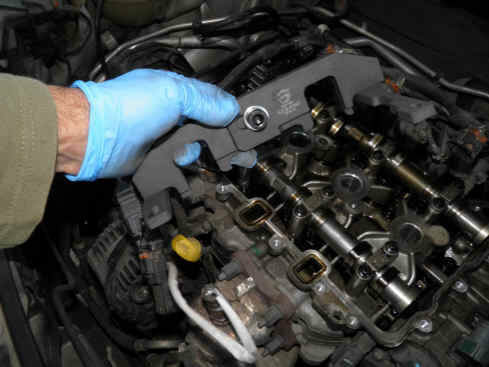 See our specific page for intake manifold removal. 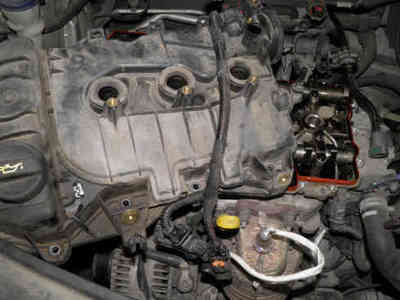 Remove the coils and spark plugs. This is because you will have to turn the engine by hand, so eliminating the compression is a must. 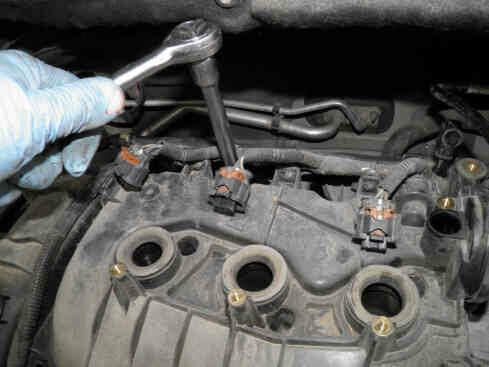 Remove all cylinder head cover bolts and disconnect all harnesses and hoses that are fixed to it. 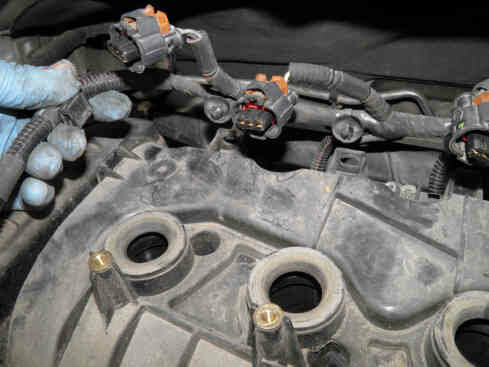 Disconnect 2 injectors at least to provide some movement freedom for the electrical harness that crosses on top of the cylinder head cover. 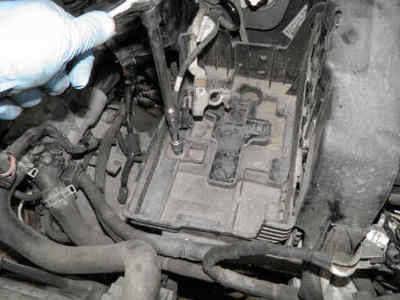 Slide it left below the electrical harness (middle right) and take it out. You need first to immobilize the EB2 engine camshafts and flywheel. 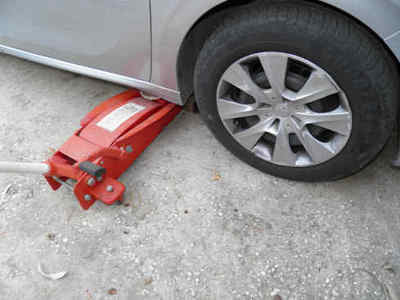 Raise the vehicle on the right side just enough to let the wheel rotate. 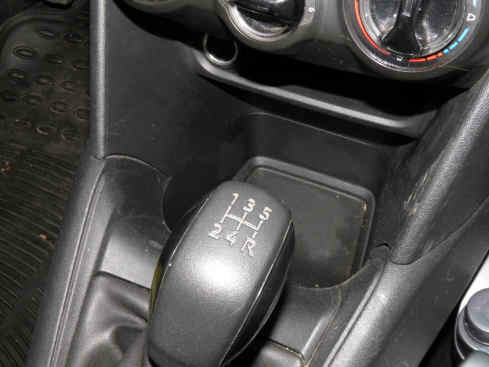 Engage the 5th or 6th gear. Locate the place where the camshaft locking tool will be fitted, that is on the specific square shaped tool seats on the camshaft, just next to the first set of bearings to the left (picture to the right). The squares have one curved side which should be pointing downwards for inserting the tool. ​See further below to understand how exactly it mounts. 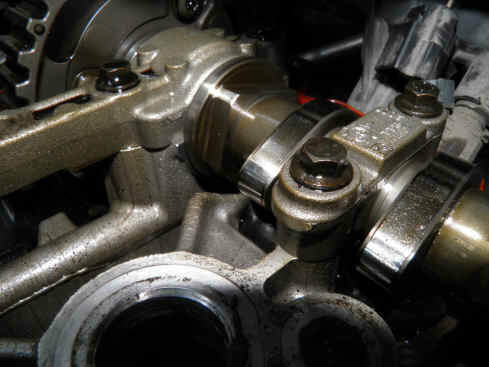 The EB2 camshaft squares will have their round side facing downwards twice upon a full engine cycle. 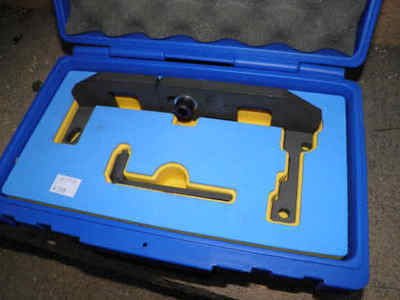 They will be synchronized with the flywheel locking tool (left picture) only once. 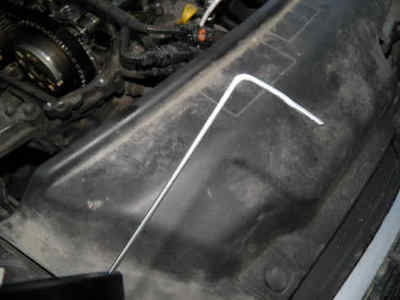 For this reason, you need to rotate the engine clockwise using the right wheel until they face downwards, then try to introduce an elbow pin that you cut from any steel wire cloth hanger (middle). If the steel wire pin goes into a hole in the flywheel, this means you are on the right half-cycle and you can now attempt to lock the flywheel. If not, rotate the engine one more turn and try again. 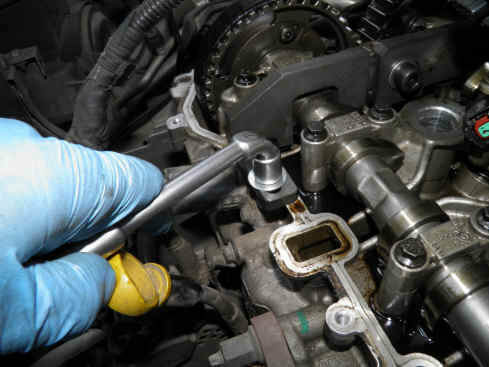 Put one drop of oil on the crankshaft locking tool and keep trying to introduce it in the flywheel while rotating the engine clockwise very little between one attempt and the other. Repeat until the locking tool goes in (right picture). 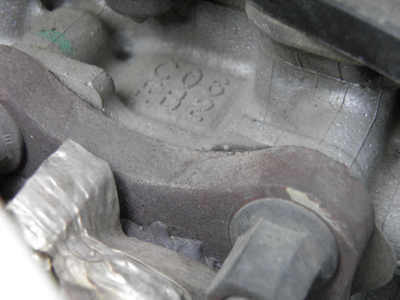 If you pass the hole on the flywheel, do not rotate the engine counter-clockwise, rather 2 full turns (so one cycle) and try again. 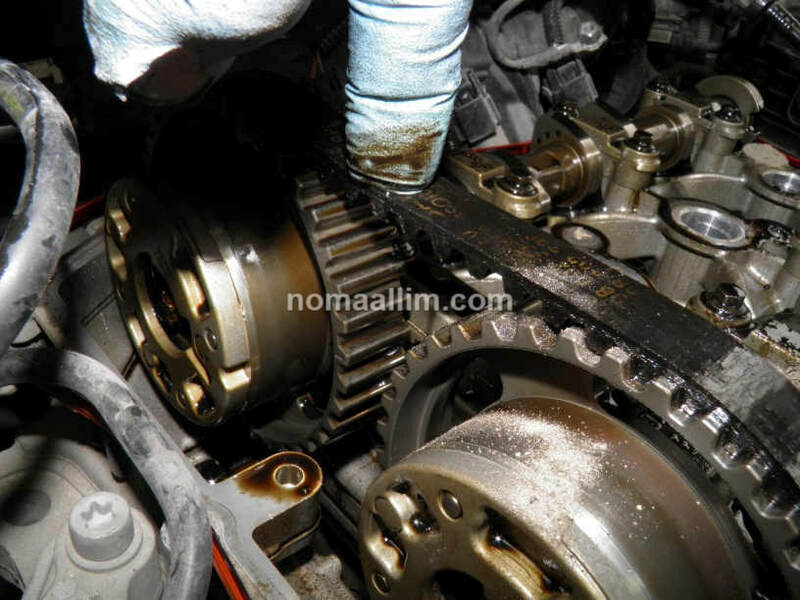 Once this is done, make sure the wheel can no more move clockwise or counter clockwise to be certain that the flywheel is locked. 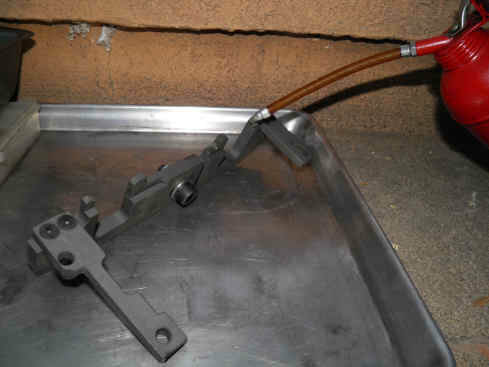 Put some motor oil on the EB2 engine timing setting tool and slightly loosen its bolt, the one that assembles its two parts. 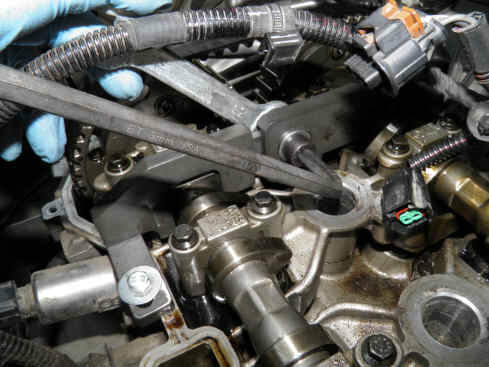 Insert it gently onto the camshaft squares as shown in the right picture. 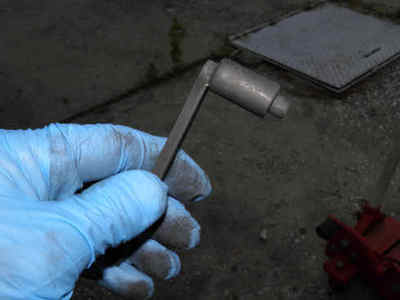 Fix it with bolts and tighten its central bolt.